When I moved here 13 years ago (almost to the day), I was determined to create a backyard habitat that would be welcoming to native birds. With this in mind, I have never used pesticides and I purposefully planted trees that would produce berries at this time of year, when pickings are scarce, to feed my avian visitors. 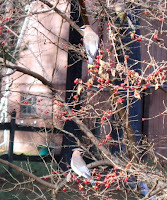 So I was simply delighted this morning to see that a small flock of Cedar Waxwings had joined the robins to feast on the red berries of one of the trees I had planted as a seedling, so many years ago. I'd never observed them here before.